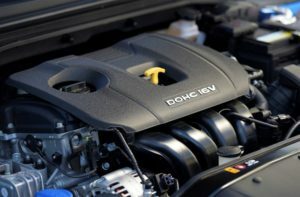 My experience with Hyundais follows a consistent theme: a Korean automaker that packs huge amounts of value for the price. In this respect, they seem second to none. That’s why I looked forward to driving the seemingly plebeian 2017 Hyundai Elantra. The Iron Grey Elantra SE I drove doesn’t stray from the look typical of today’s four-door economy sedans. However, certain details inside and out raise the design bar for the segment. The sedan shares some of these with its stablemate, the Elantra GT (hatchback) version. Columns of LED daytime running lights sit just ahead of the wheel wells. They give the Elantra’s front end a sportier look. LED rear lights keep the modern, sporty look consistent at the other end of the car. These “light columns” flank a huge hexagonal grille where a front bumper would traditionally be. The lower front fascia also integrates functional front wheel air curtains, a component derived from the Sonata Hybrid that helps manage air flow from the front of the vehicle and around the wheels to minimize turbulence and wind resistance. The roof slopes down to the trunk, blurring the lines between roof, rear window and trunk. This looks great and undoubtedly helps with aerodynamics – Hyundai boasts a 0.27 coefficient of drag for the Elantra – which in turn means better fuel economy. Neither of these benefits will matter to rear-seat passengers over six feet tall. In fairness, cramped rear quarters in this segment of the auto market are nothing new. Pull open the door handles, but notice the subtle LED accent lighting in them before you do. They’re triggered by remote keyless entry, a standard feature on the Elantra. Front seats and the steering wheel are manually adjustable. I would have liked being able to raise the front of the seat, but otherwise found myself comfortable in the car. 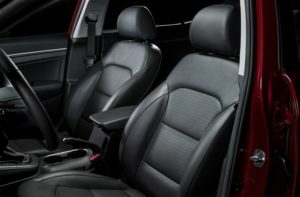 Available premium convenience features include power seats and driver seat and side mirror memory settings. That rear seat may be cramped, but if you fit there, you’ll probably like it. 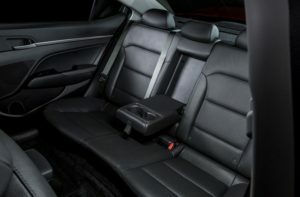 Passengers can also enjoy available heated front and rear seats in the LE (heated front seats are standard). The LE also comes with a heated steering wheel, a lovely touch during a blustery winter day’s driving. The Elantra may be compact, but its trunk sure isn’t. 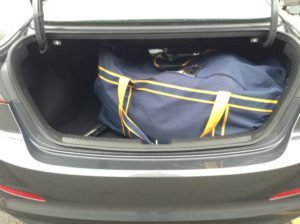 My sticks had to go through the 60-40 split rear seat, but with the rear seats up, I could have fit two bags into this spacious trunk. 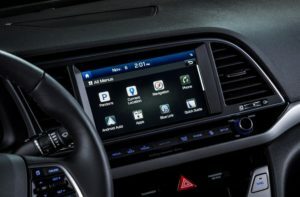 The base Elantra ships with a 4.2-inch color TFT LCD instrument display. My SE tester featured the available 7.0-inch Display Audio touchscreen system with rearview camera. 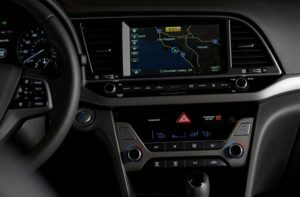 Other trim levels offer Hyundai’s next-generation 8.0-inch navigation system. These multimedia systems are equipped with Apple® CarPlay and Android® Auto support. Designers organized controls logically on the centre stack, which is slightly angled towards the driver. Audiophiles will want to check out the optional Harman-patented Clari-Fi™ music restoration technology. Clari-Fi™ claims to analyzes digital audio files during playback and rebuild much of what was lost in the compression process. Hyundai also offers Blue Link, a suite of enhanced safety, service and infotainment telematics. These include features like Remote Start, Destination Search powered by Google®, and Car Finder. Drivers can access Bluelink features from buttons on the review mirror, but technophiles will use the web, smartphone apps or smartwatches. Much of what’s listed above is optional equipment on the Elantra. One thing I found cool was the push-button start, a feature not often included on a car in this segment. Hit the button and you fire up a 2.0-liter four-cylinder engine producing a peak 147 horsepower at 6,200 rpm and 132 lb. ft. of torque at 4,500 rpm.Power traveled through a six-speed automatic transmission. This is no rocket, though the Elantra proves peppy enough when it needs to be in everyday driving. A six-speed manual is also available in the Elantra SE trim. Hyundai offers a second engine option: a 1.4L turbo four, joined to an EcoShift seven-speed dual-clutch transmission. The ride is quiet and handling is smooth and confident, even on windy, snowy evenings. The 2017 Elantra is lighter than the outgoing model, though its chassis is now reinforced with 53 percent advanced high-strength steel compared with 21 percent in the previous model. Hyundai “solidified” the Elantra to chase a better ride and higher safety ratings. Active safety technology is not wanting either. 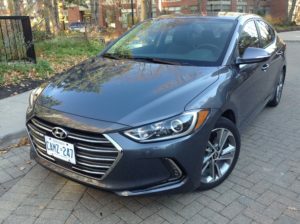 These sensible active safety technologies might not be expected on economy vehicles, but Hyundai brought a number of them to the Elantra. 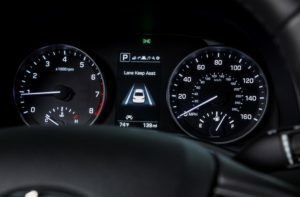 Drivers may be surprised by Lane Departure Warning, Lane Keep Assist, Automatic Emergency Braking with Pedestrian Detection and Blind Spot Detection with Rear Cross-traffic Alert. The Elantra L Manual starts at $15,999 MSRP. The SE model provided for my test starts at $23,999 MSRP.